Explore how materials choices can influence a design to fit a circular economy. When choosing safe materials, it is essential to explore the implications of material choices at each phase of its life cycle: during production, the use phase, the after-use phase, and when bringing materials back into the system again. To effectively design a product for ongoing cycles, it’s important to consider the impact of material choices across each of these life cycle stages. The chemicals and materials used throughout the product life cycle matter because they can pose risks to humans and the environment. Developing an awareness of these risks is the first step towards designing in a different way. There are multiple approaches that can be taken to ensure safer material choices. Through this mapping exercise, you will explore which areas you can affect the most as a designer. Choose a product that you are familiar with. Try to select one for which you have a deep understanding of its parts, how it is made, how it is used, and what happens to it after its use phase. Don’t worry if you don’t have all the details: the purpose of this exercise is to explore and map what you do and do not know. 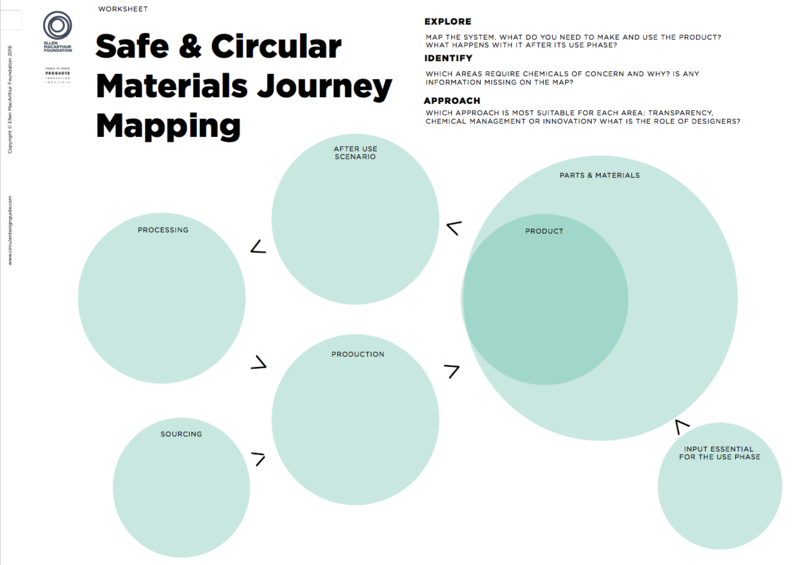 Download the Safe & Circular Materials Journey Mapping worksheet and put this product in the centre of the worksheet by either making a quick drawing of it or by writing its name. Identify on the worksheet what you already know or can identify about the materials and chemicals used in the product. Find inspiration by looking at some of the results of the Circular Design Brief. Make a small drawing of the product in the product bubble. Depending on what you select, you may also think about any additional input necessary in the use of the product. For example, a coffee machine needs ground coffee, and a car needs fuel. When you have a closer look at the product, identify what you know about its parts and materials. Also, consider packaging and other factors that may be necessary to deliver this product to its user. Try to go all the way back to the raw materials that are necessary to make this product, as far as you are able. Now that you have a list of all the parts and materials, you can start to map the production process. Think about the production and treatment processes required to create the product. Are there any coatings, finishes, dyes, bleaching agents, or other additives used? Next, consider where the materials originally came from. How are they sourced? Are there chemicals needed in the sourcing phase? When exploring the impact of a product, think about the processing journey the materials have gone through to emerge as a finished product. Where might chemicals of concern be applied at the various stages? How can reflecting on these life cycle stages help you make decisions to increase the safety and circularity of your product? Finally, map out what happens to the product at the end of its initial use phase. Where does it go? What happens to it when it is no longer useful to the user? Explain the after-use scenario of the product. Are there any steps required to transform the product after its initial use phase before it starts a new use cycle? Remember: you don’t need to have all the answers. The focus of this exercise is to help you explore and map what you know, where gaps may be, and identify how you can take steps forward. What information do you have access to for each of the life cycle stages? Is there information missing? What other information would improve your understanding of the product and its wider system? Are there other members in your team that could have more information about the product? Would suppliers be able to share more information? Chemicals of concern can be included intentionally or unintentionally at each stage of a product’s lifecycle. These chemicals can pose risks to people in the sourcing, manufacturing, use, and throughout the after-use scenario, as well as to the environment (e.g. polluting water, air or ecosystems). Hazard refers to a substance's potential to cause harm, whereas risk includes exposure to the user and therefore indicates the likelihood of harm. There is only a risk when there is a reasonable pathway to exposure. 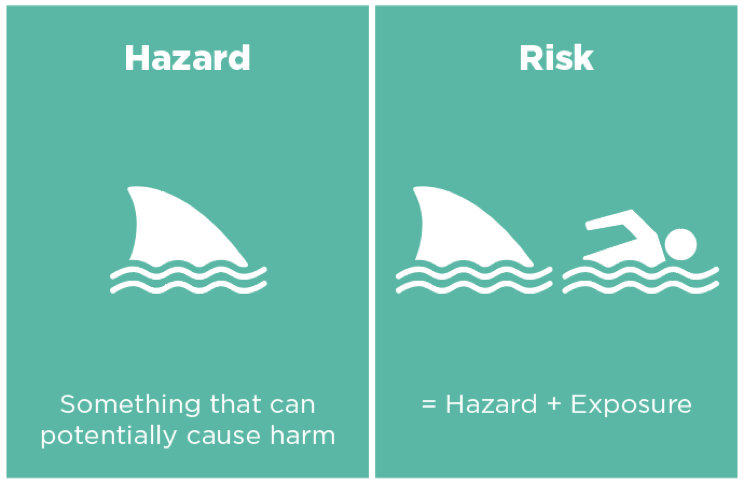 As an analogy you could think of a shark as a hazard because it has the potential to cause harm, but it only becomes a risk when people swim nearby. However, it may be hard to tell if a shark is close, so it may be best to avoid the hazard as a precautionary approach, or provide a warning at the very least. Mapping the product life cycle can help you spot where the product’s hazards may pose a clear risk to humans or the environment. Identify in your map where you foresee the potential for chemical risks at each stage of the life cycle. Where are your materials sourced from? And how? What chemicals may be used in the processes of sourcing, manufacturing, production, use and after-use? 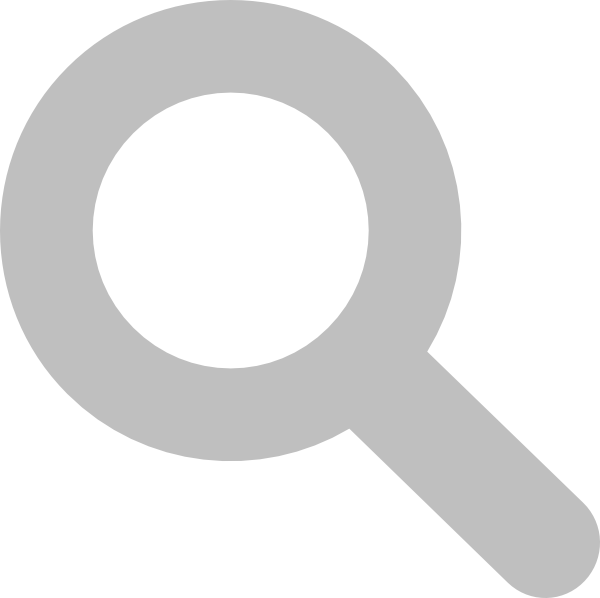 What chemicals may be released as effluents during manufacturing? What happens to manufacturing waste water? Who are the potential subjects of chemical exposure at each life cycle stage? Consider workers, communities, wildlife, the user, the maintenance person. What are the pathways to exposure? Is it through air, water, soil, ingestion, inhalation, or skin contact? Are there aspects of the product design that may reduce or eliminate exposure of chemicals of concern in the product to humans or the environment? 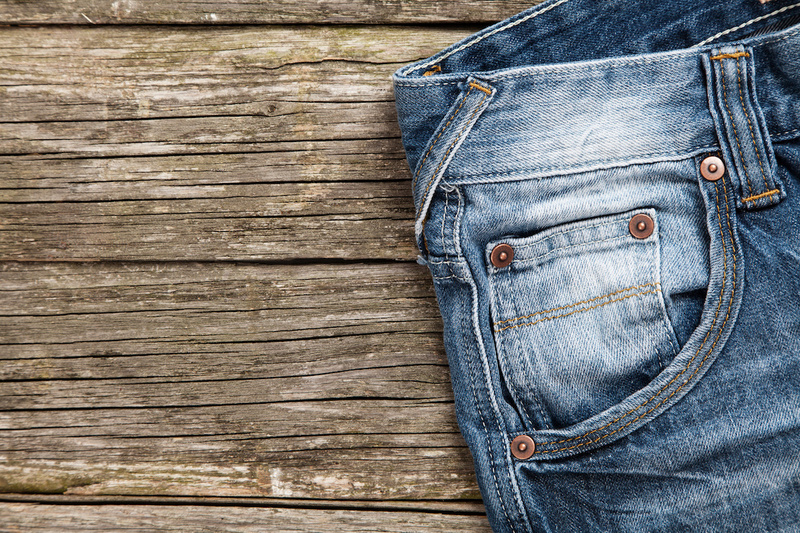 In the manufacturing of jeans, chemicals of concern can be applied at every stage of production, from growing and dyeing the cotton, to washing the denim to create worn effects. That’s why it is important also to consider potential impacts before the use phase. You have now identified where chemical risks can occur. Mitigating these risks begins with three different approaches: transparency, chemical management, and innovation. Transparency: in the context of material health, creating an inventory of the materials and chemicals used in a product and its manufacture involves engaging with the supply chain. Compiling accurate and transparent information on the chemicals and materials used in a product is the first step towards ensuring their safety. Activities related to the inventory approach include engaging with raw materials suppliers and creating a materials inventory or bill of materials (BOM). Chemical Management: the screening of chemicals takes place in a number of ways. From regulatory compliance and restricted substances lists to proactive toxicological assessments, data is used to eliminate known or suspected hazardous substances and move toward safer chemistry. Innovation: when suitable substitutes do not currently exist from a chemistry perspective, design innovation can help eliminate the need for chemicals of concern while ensuring a product continues to meet its function, quality, performance, value and aesthetic requirements. Designers play an important role when it comes to innovation as an approach to designing out chemicals of concern. Activities related to the innovation approach are set out in the Safe & Circular Strategy Cards. Reflect on the life cycle stages that could result in risks and identify the approaches that you could take to mitigate them. It’s important to remember that these approaches are often not taken in isolation. They are part of an iterative journey of continuous improvement, so you may layer a number of these approaches as part of a multi-phase process. Finally, consider where your role as a designer could have the most impact on making safe and circular materials choices. From a design perspective, a chemical of concern identified through Material Health assessment may potentially be substituted by a safe chemical. Alternatively, when these chemicals are critical for desired performance, innovation may play an important role to reduce risk. Reflect on how you as a designer can integrate safe and circular thinking in the design process. Reach out to the Circular Design Guide community on LinkedIn to share your ideas, seek advice or discuss other circular design related topics. G-Star RAW introduced the World’s First Cradle to Cradle Certified™ Gold Denim fabric as part of their Most Sustainable Jeans Ever which represents a holistic approach to sustainable denim design. Chemicals are used throughout the textile production process. ChemSec’s Textile Guide will walk you through the stages – from fibre to garment – to illustrate how this takes place. The substitution process starts with identifying a chemical that needs to be removed, and understanding what function it has in the production process or properties it gives to the product. Find out more in ChemSec’s Beginner’s Guide to Substitution. The Advanced Methods on Safe & Circular Material Choices are a collaboration between the Ellen MacArthur Foundation and Cradle to Cradle Products Innovation Institute. The Circular Design Guide is a collaboration between the Ellen MacArthur Foundation and IDEO. To give your feedback, email us directly or join our linkedin group. Copyright © Ellen MacArthur Foundation + IDEO 2017.